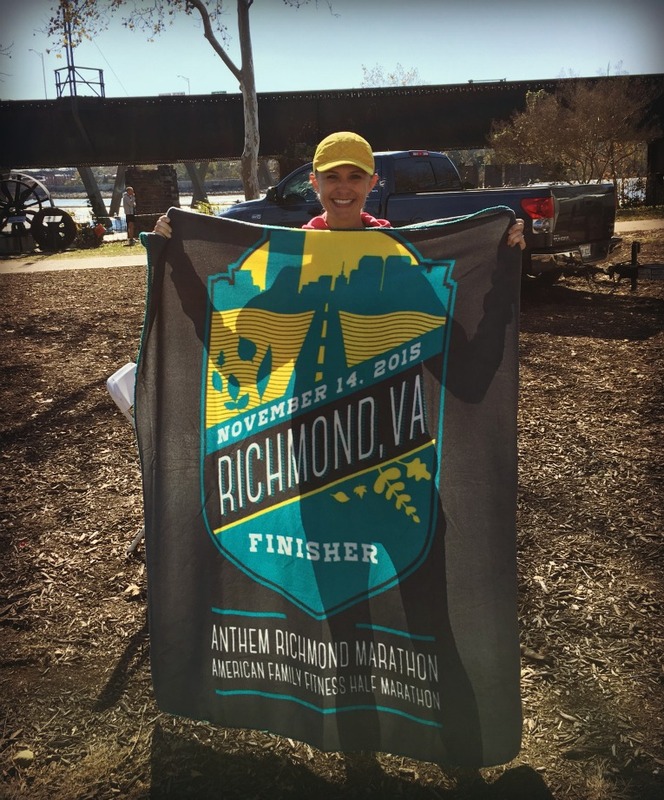 The Richmond Marathon was really great. 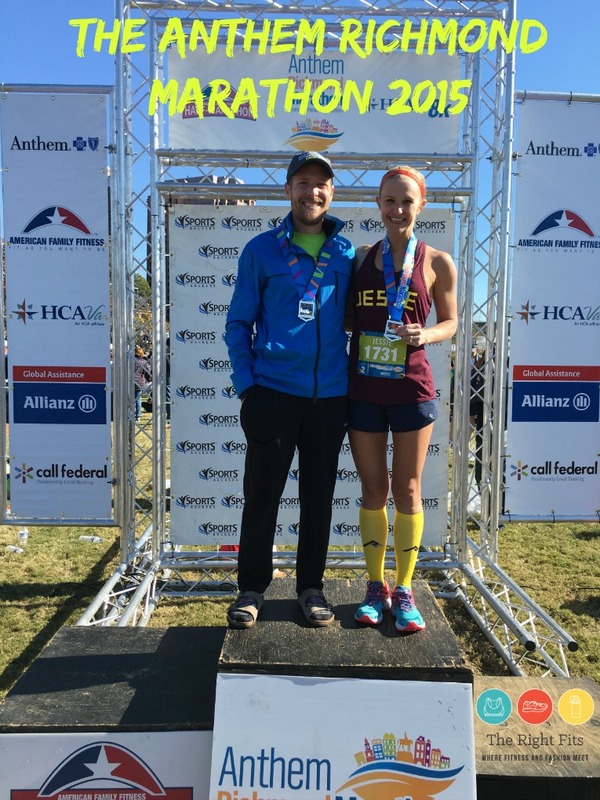 I think it might be in my top 5 favorite marathons…which would be Tokyo, Twin Cities, St. George Utah, Big Sur, and…Richmond! Actually, it’s probably tied with Steamtown in Scranton, PA, but it was definitely a good one. 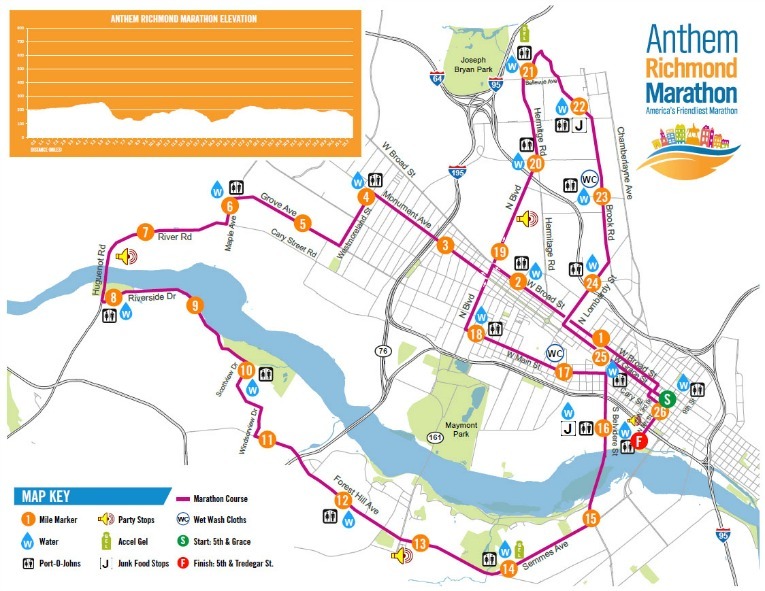 The Richmond marathon was the perfect size with about 4600 marathoners. I love a mid-size marathon like this. The event included a half marathon and an 8k, but the race organization did an awesome job of keeping those races separate. The courses merged at the end, but were kept on separate sides of the road and so not annoying in any way. 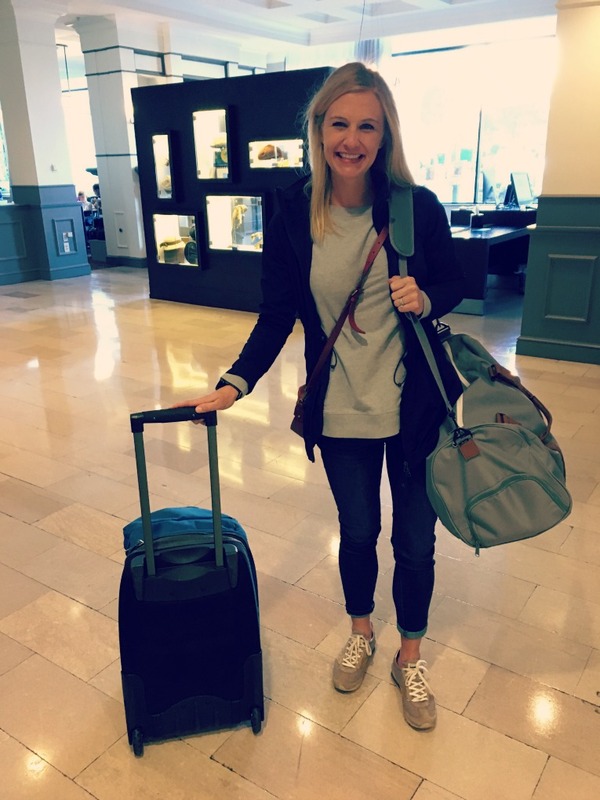 As I mentioned in this post, we stayed at the Hilton Garden Inn which was literally a block from the start line. In fact, we went down to the start area around 7 am (the marathon started at 7:45). Once we realized just how close we were, we went back to our hotel room to use the bathroom there again instead of waiting in line for a port-a-potty. Amazing. There were multiple waves based on your predicted time, with Dustin in Wave 1 and me in Wave 2, but there wasn’t a waved start. With only 4600 marathoners, it wasn’t necessary. I placed myself at the start line near the front of wave 2 and my gun time was only about one minute different than my chip time. Seriously one of the easiest start lines ever. If you are interested in the Richmond Marathon, stay at the Hilton Garden Inn downtown. After the national anthem, we were off right at 7:45 am! The weather was pretty fantastic: 40 degrees at the start. It was quite sunny and pretty windy, but I can’t complain about temperatures like that. By the time I finished, it was about 55 degrees. Lovely marathon weather. It sounds like the weather is typically good for running in Richmond this time of year. Aid stations were every two miles (exactly two miles) until the final five miles; then they were every mile. They had Powerade and water and were not traffic jammed but super easy to maneuver. Bathrooms at every aid station and GU’s at two places along the course. The course has some serious rolling hills and a significant uphill around mile 16, but there was also plenty of downhill. In fact, the finish was a CRAZY downhill- LOVED it! The course went through some very beautiful neighborhoods with some gorgeous historic homes. It also showed off all the fall colors along the James River. So pretty. It crossed over two bridges, which were a little tough mentally (and very windy!) but still a really nice course. As I mentioned, the last 1/4 mile was all downhill- like VERY downhill. I felt like I was flying! The finish line was so well organized. I received my medal and was shuffled through the chute right to the gear bag pickup. Then there was all kinds of awesome food at the finish- chocolate milk, pizza, fruit, Gatorade, and Sierra Nevada beer! 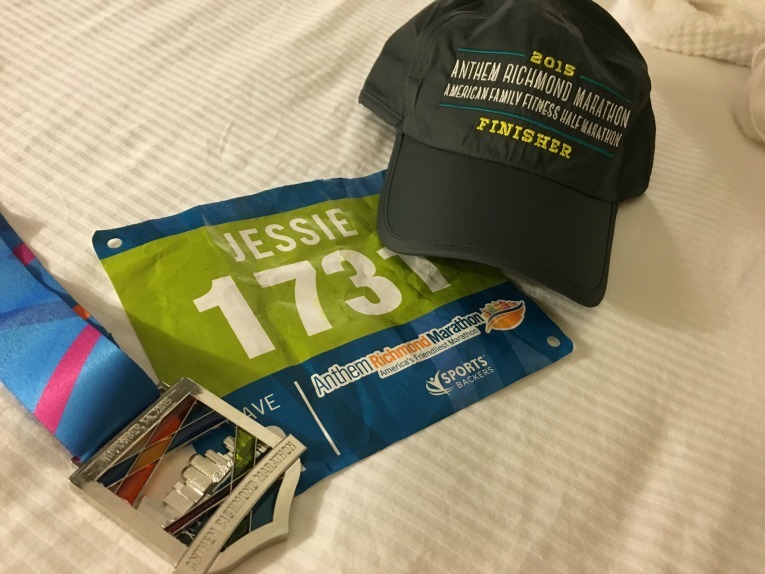 All finishers were given a Richmond Marathon running hat and a fleece blanket- what a nice touch and so cozy after the race! We also received bright green long-sleeve finisher’s shirts. The medals were pretty awesome too. It was a PR, but not quite what I was hoping for. I am confident that I am capable of a 3:37-3:38, but I fell apart in the last 10k at the race because I went out too fast. My coach had told me to do about 8:20’s for the first 8 miles and then drop the pace to 8:15. I didn’t listen. To run a 3:37, I would have needed to average an 8:18, which I know I can do. I don’t mean to sound cocky at all, but I trained to run that time and I trust my training and my coach. I just wasn’t smart on race day. You’d think with this being my 20th marathon, I would know better than to start too fast right? Nope. The marathon is still a tricky beast that way! Bathroom stop? I have never had to stop before during an actual race. I have to wonder it was because I was used to taking Sound Probiotics every day and recently they were totally backordered and I ran out (my fault, I didn’t plan ahead.) I wonder if my gut was a little off after taking it consistently every day for nearly the past year and then stopping right before the race. That bathroom stop definitely cost me at least 2 minutes- ugh! Even though having to stop was annoying, I can’t say that was the real issue. The issue was that I got too excited and ran too fast in the beginning. The bathroom stop just didn’t help. Even with my tough final 10k, I still had such a fun, fun time! Absolutely. 100%. Still love the marathon. Loved Richmond. I crossed the finish line and got my gear check bag and was able to check the runner tracking application on my phone and that’s when I saw that Dustin ran a 3:03! I quickly got over any of my own disappointment in not qualifying for Boston and got choked up with excitement for him. A 3:03 is an 11 minute PR, and well under the qualification standards for his age group (for Boston 2017, he only needed a 3:15). We quickly met up at the family reunion area and I was so, so proud of him. He was very excited when I saw him! We grabbed our free Sierra Nevada, but I’ll be honest, I didn’t drink most of mine. I felt pretty nauseous after the race. The best thing I had at the finish? A sample from McDonald’s of a smoothie of some sort. That tasted like heaven. Oddly, I’m not really sore at all!?!? Usually there is at least one day of walking down the stairs backwards, but my legs feel completely fine. I honestly think its because of my training- I think the high mileage helped prepare me for this race. Today (Sunday) I feel FINE. It’s almost strange how great my legs feel…Did I not push myself hard enough? I sure felt like I did! I guess I have Antonio and his training program to thank as its definitely not normal to feel this good. I guess I’ll take it! London 2016 in April! Yep, Dustin and I are registered for our next international race, the Virgin Money London Marathon on April 24th! I’m very excited for London, but I don’t think it will be my BQ opportunity. Historically, I don’t have great luck at the international World Majors- too crowded, jet lagged, etc. My coach thinks I should do a different marathon in late February or March instead with a BQ goal and then just run London for “fun.” I really want to BQ so that Dustin and I can both run Boston 2017 together. I’m looking at Phoenix late February or Napa in early March, but it depends on if I have to travel for work that month. TBD. Let me know if you have any suggestions! 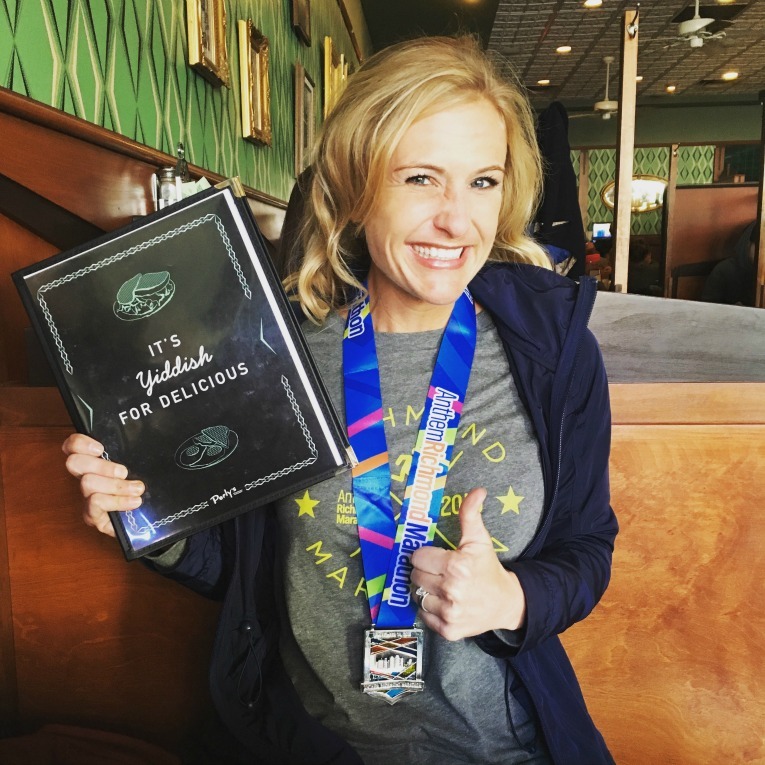 After the marathon, we headed to lunch at Perly’s– awesome sandwiches that hit the spot! The sandwiches were enormous though and I was in a bit of a food coma (post-marathon coma?) so we crashed at the hotel for awhile. 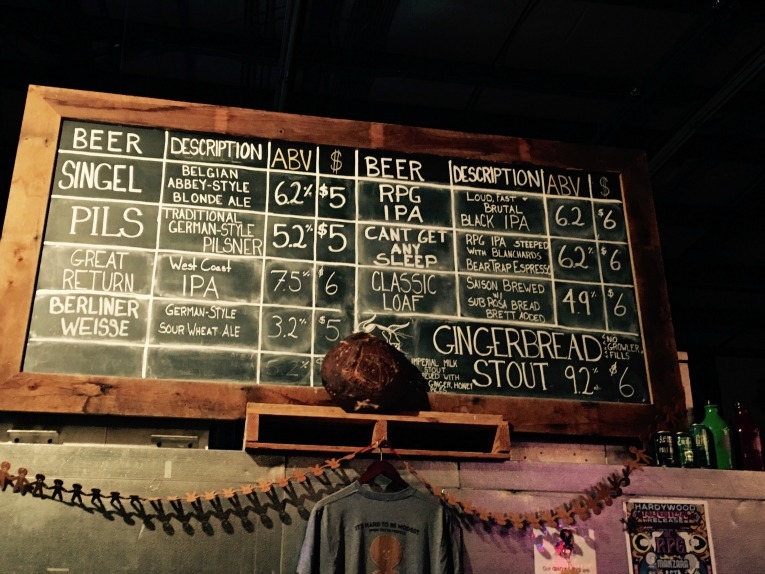 Eventually we made it out to Hardywood Park Craft Brewery for some beers and live music. What a cool place! We didn’t last long though…It’s crazy, but running 26.2 miles will really tire you out, ha! This morning, it was an early flight back to Minneapolis. It was a short weekend in Richmond, but a great one! Thank you again to any one who is reading. 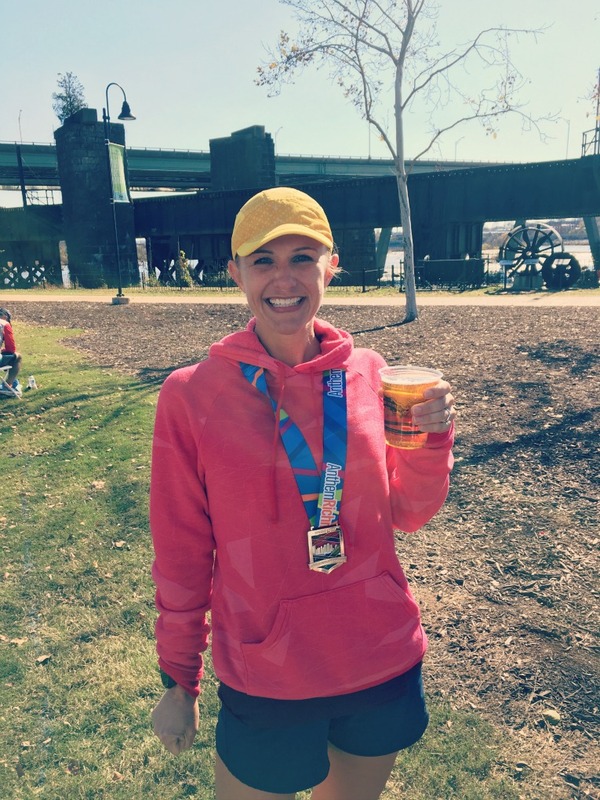 I love sharing my running adventures here and I’m so glad you are following along! 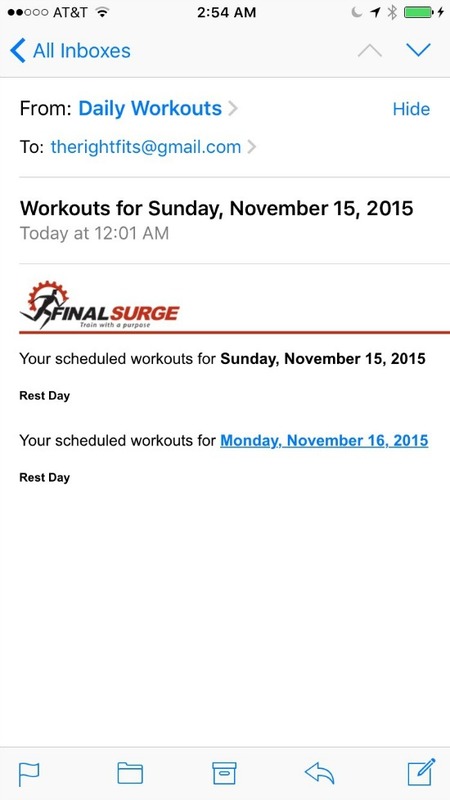 « The Day Before the Richmond Marathon! Nice job, Jessie! 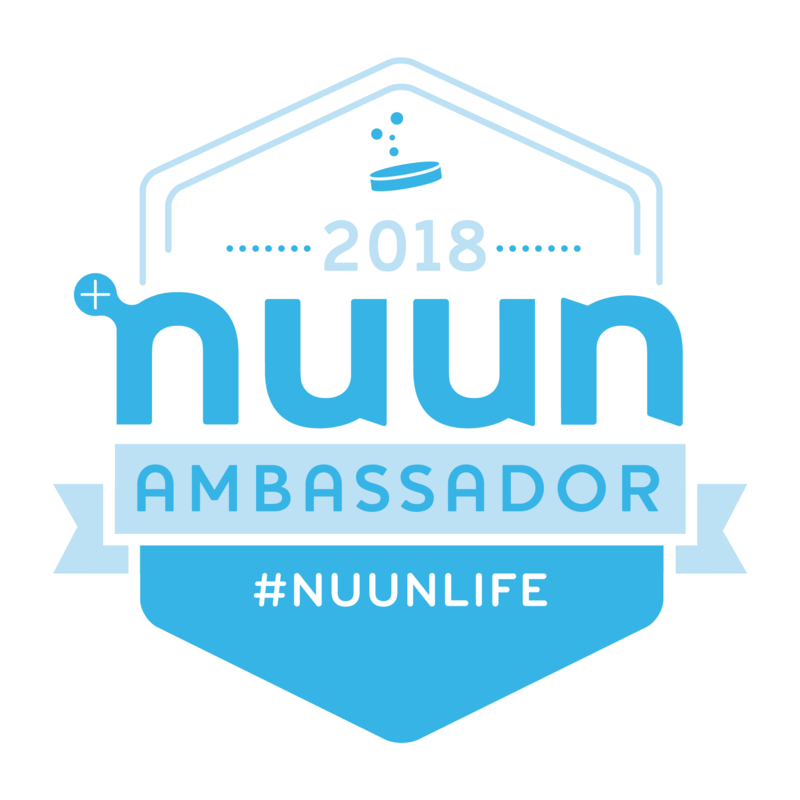 RE: the non-soreness…hopefully, you’re still feeling good on Day 2 post-race (that’s when the soreness kicked in for me after my most recent marathon)! I still feel pretty good but I have experienced DOMS before 🙂 it might still sneak up on me. What is your next race Katie? Ha! Yes, I wish my “fitness and fitness fashion budget was a bit bigger 🙂 Too many fun races around here! Good luck at the Trail Mix and Eau Claire! Awesome Nicole! I have heard good things about Phoenix. I hope it works out with my work schedule and then I’ll see you there! AMAZING job, Jessie! That’s a great PR, especially with the hills, wind and a pit stop! So glad (and jealous) that you are feeling so well after the race. The runner tracking worked great – no delays. Was amazing to get the updates as you both were crushing it. Dustin’s time pretty much had me in the fetal position – that was just incredible. Celebrate and recover well! You deserve it! Glad to hear the runner tracking was good! Yes, Dustin’s time was amazing- 7 min/miles the whole way! I think sub-3 hours is within his grasp. Congrats on a great race and a PR! I agree with your sentiments on Richmond, it was a really fantastic race. Also, two thumbs way up for having your recap already posted!!!! Definitely a well organized lovely race- glad you agree. Congrats on your PR! Such wise words! You’re such a supportive friend- THANK YOU SARA! I have to say, the DOMS could sneak up on you… catch you when you least expect it… You’ll jump up to use the loo and you’ll be on the floor! I still feel pretty good today and am excited to do some non-running (strength!!!) this week! Thanks Katie! Richmond had a lot of Southern charm, I definitely enjoyed it! 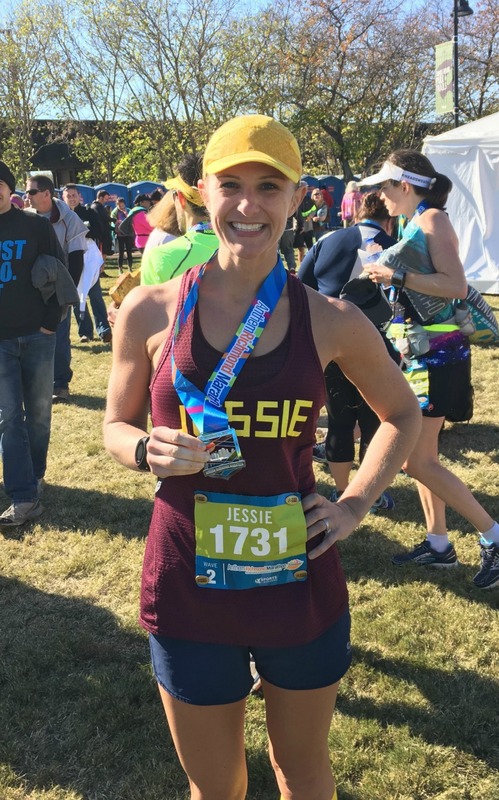 Congratulations on the PR, Jessie! I might have to put this race on my list for next year. How did you like running in the compression socks? I always enjoy reading your posts 🙂 Hope you had a nice recovery week! Thank you so much Rachel for reading and commenting! Well done on your PR – great job! I really hope you enjoy the London marathon. It’s a fantastic event and one I’d love to run in again. Sadly the ballot entry is just too crowded now, but I’ll get back there eventually! I’m very excited for London- You will have to give me some expert tips as it approaches. My husband and I had to go through Marathon Tours to get in; definitely not an easy one to get into! Not easy at all. The year I ran it I was lucky enough to get a place through a running club. Thanks Allison! I’ll let you know.